encore Deals! 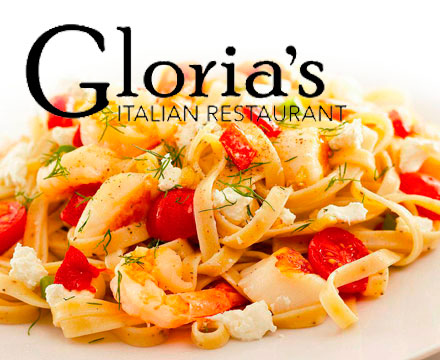 | $15 for $30 at Gloria's Italian Restaurant! $15 for $30 at Gloria's Italian Restaurant! Expires 6/30/2013. No cash or credit for unused portion; Not valid for use with other offers or promotions; Does not cover gratuity; May be purchased as a gift; Limit one per table per visit; Only valid for parties of two or more. Italians have a saying to describe someone who relishes exceptional food. E’ una buona forchetta. “A good fork.” Each of our chefs fits the description. Whether slow-cooking ragu, sautéing veal cutlets, stirring risotto or arranging grand antipasti platters, these cooks demand freshness and quality. Attention to excellence continues in our cozy dining room, the perfect place to enjoy your favorite northern and southern Italian specialties with a glass of wine. Don’t forget to end with cannoli and the area’s finest espresso or cappuccino. What are you waiting for? Tutti a tavola!